Plasma Physics and Nuclear Fusion Research covers the theoretical and experimental aspects of plasma physics and nuclear fusion. The book starts by providing an overview and survey of plasma physics; the theory of the electrodynamics of deformable media and magnetohydrodynamics; and the particle orbit theory. The text also describes the plasma waves; the kinetic theory; the transport theory; and the MHD stability theory. Advanced theories such as microinstabilities, plasma turbulence, anomalous transport theory, and nonlinear laser plasma interaction theory are also considered. The book further tackles the pinch and tokamak confinement devices; the stellarator confinement devices; the mirror devices; and the next generation tokamaks. The text also encompasses the fusion reactor studies; heating; and diagnostics. 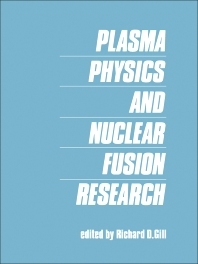 Physicists and people involved in the study of plasma physics and nuclear fusion will find the book invaluable.